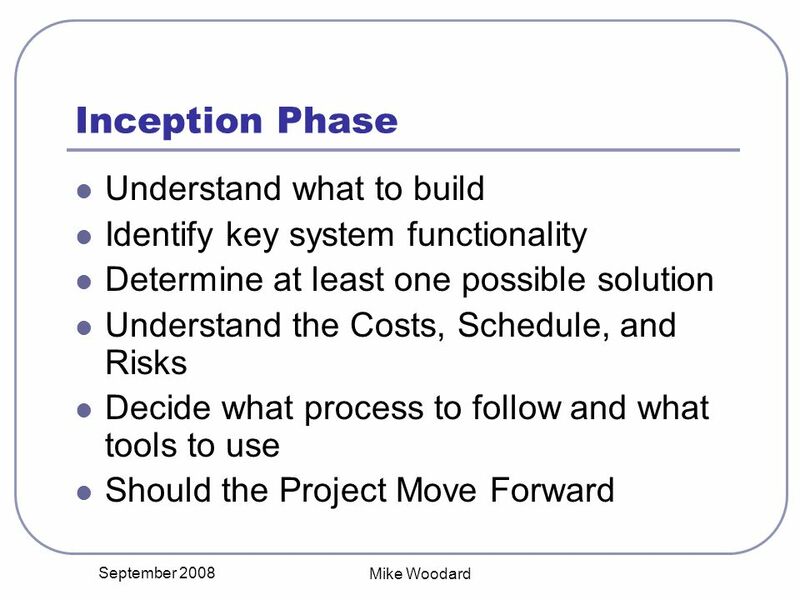 September 2008Mike Woodard Rational Unified Process Key Concepts Mike Woodard. 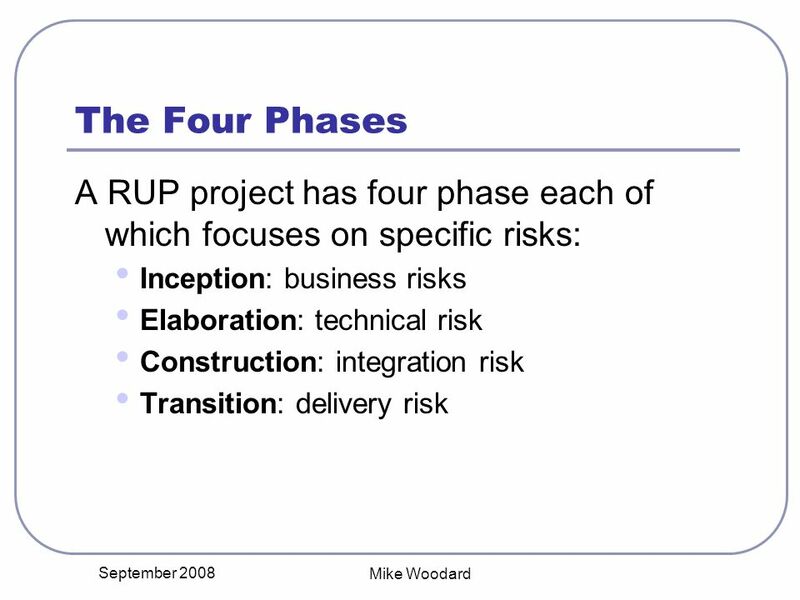 3 September 2008 Mike Woodard The Spirit of RUP - RISK Attack Major Risks Early and Continuously, or They Will Attack You Risk Management begins before the project begins and continues beyond the life of the project. 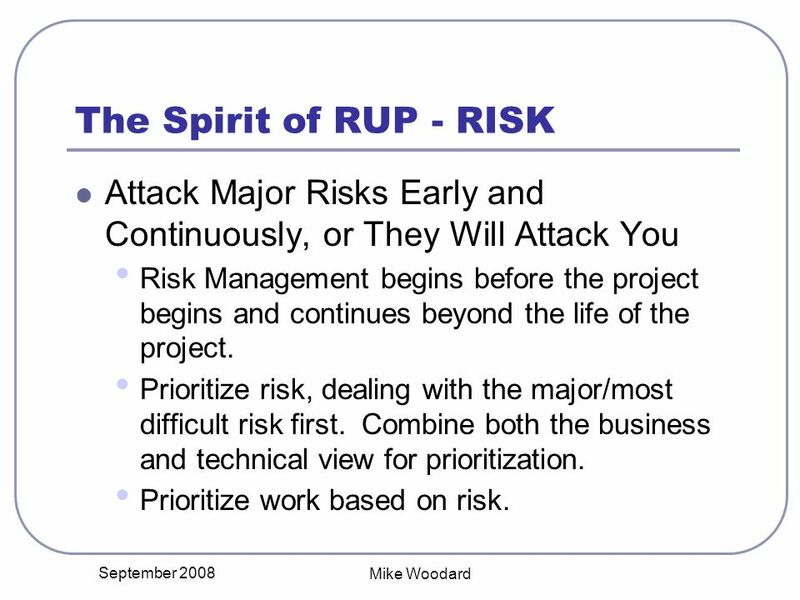 Prioritize risk, dealing with the major/most difficult risk first. Combine both the business and technical view for prioritization. Prioritize work based on risk. 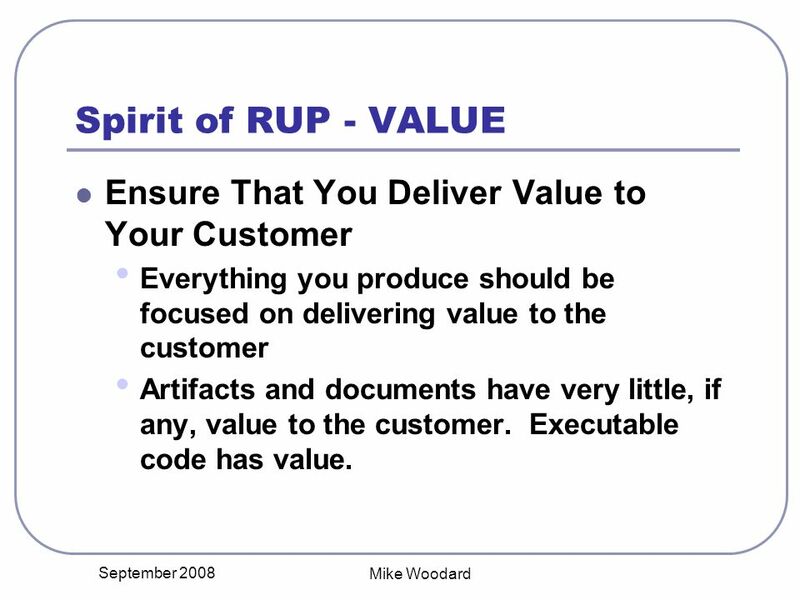 4 September 2008 Mike Woodard Spirit of RUP - VALUE Ensure That You Deliver Value to Your Customer Everything you produce should be focused on delivering value to the customer Artifacts and documents have very little, if any, value to the customer. 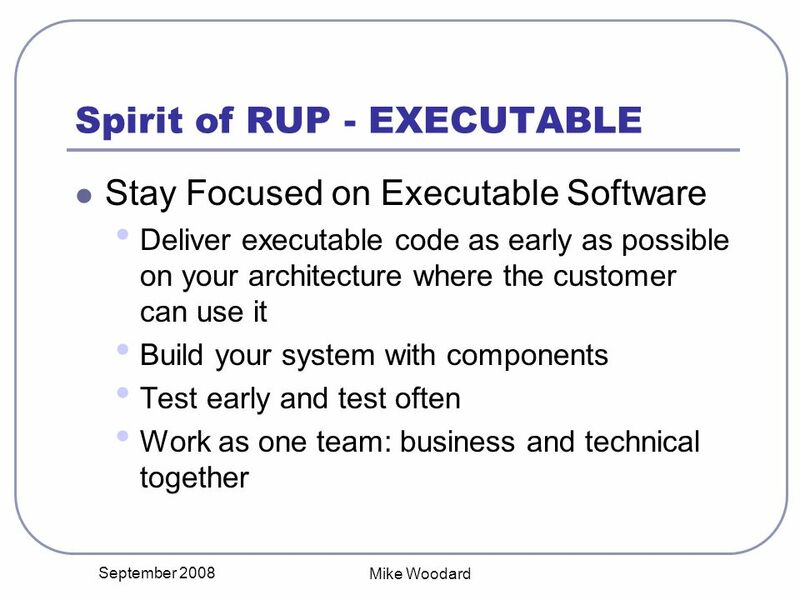 Executable code has value. 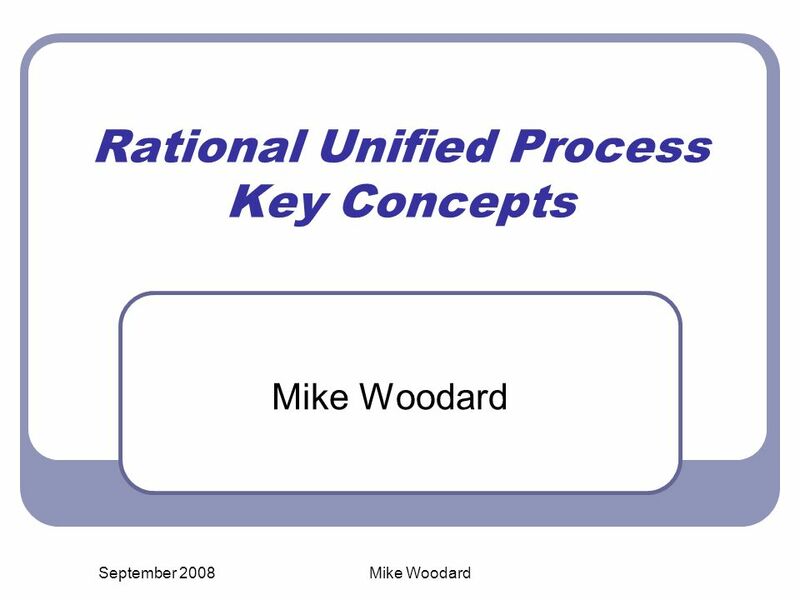 Download ppt "September 2008Mike Woodard Rational Unified Process Key Concepts Mike Woodard." 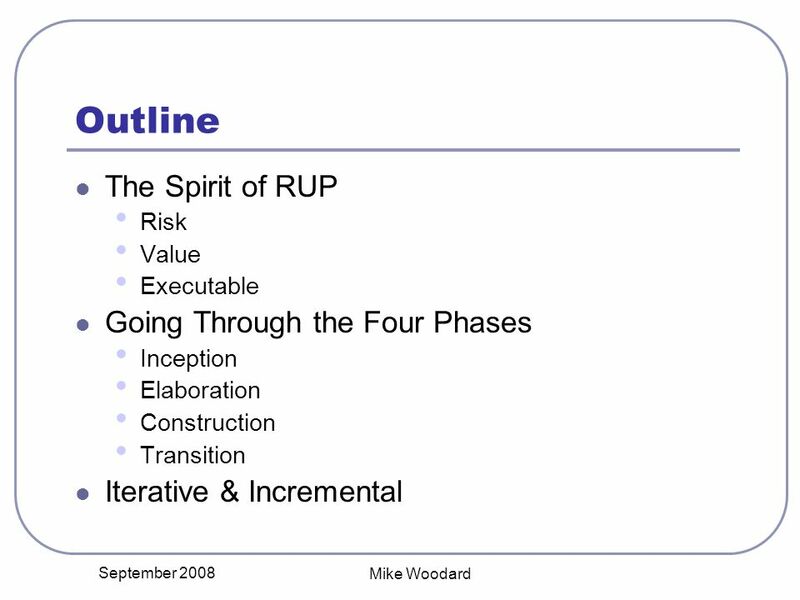 PROCESS FRAMEWORK Lecture - 3. 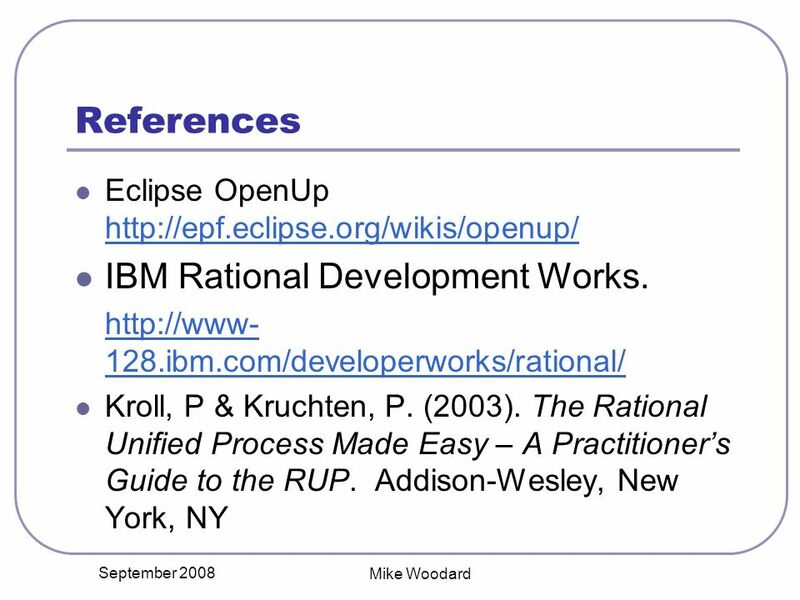 Topics covered PROCESS FRAMEWORK PROCESS MODELS DIFFERENCE. 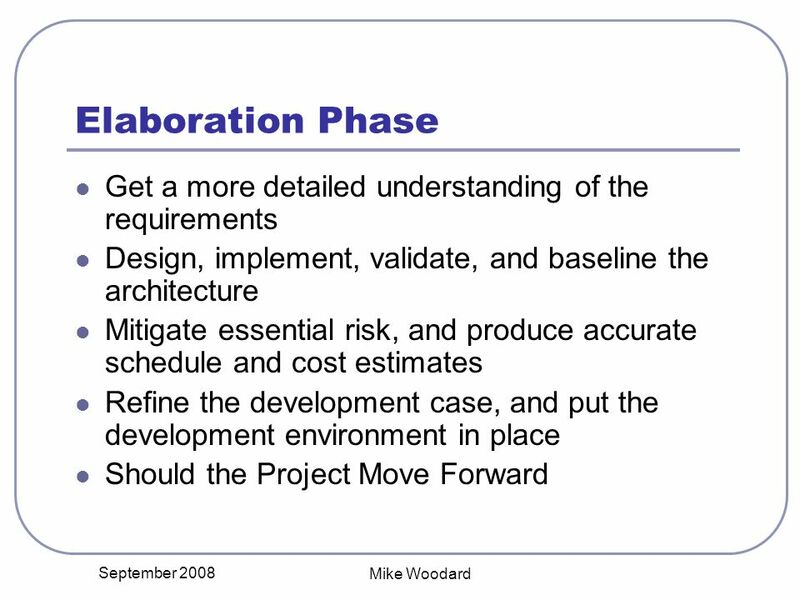 COMP1007 Introduction to Requirements Analysis © Copyright De Montfort University 2002 All Rights Reserved COMP1007 Introduction to Requirements Analysis. Arlow and Neustadt ch.21 What is the unified process? People are more important than any process. Good people with a good process will outperform good. RUP/UP Software Development Method Hoang Huu Hanh, Hue University hanh-at-hueuni.edu.vn. 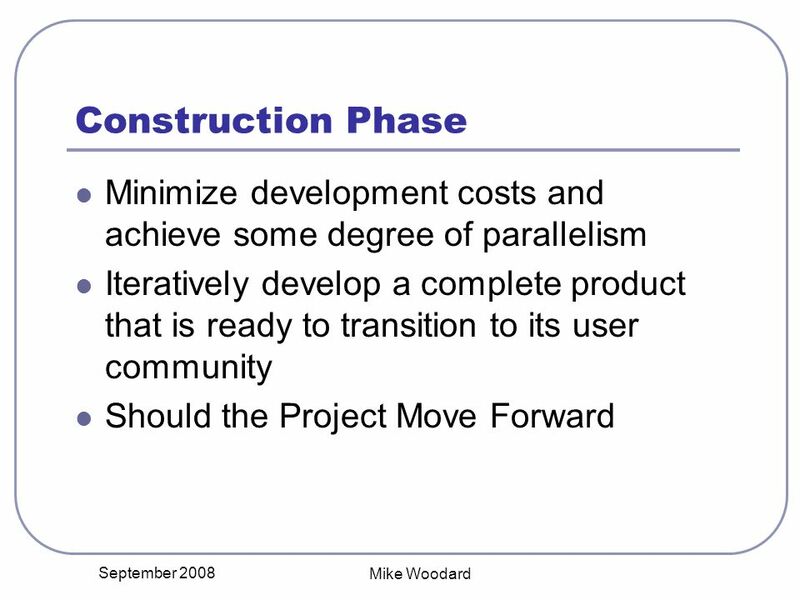 Introduction to Requirements (Chapters 1-3 of the requirements text) CSSE 371, Software Requirements and Specification Don Bagert, Rose-Hulman Institute. 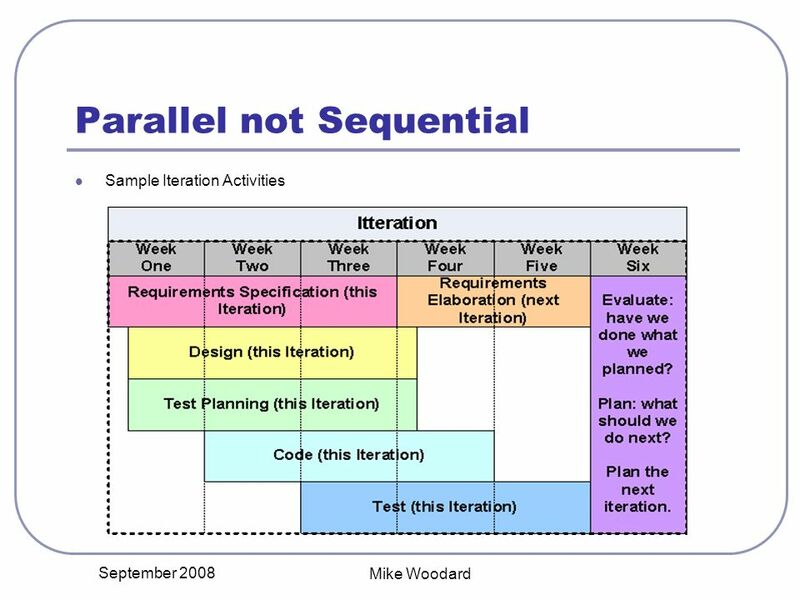 Copyright  Larry Dribin, Ph.D. SE470_ProjMgmt_v1.ppt SE470 - ProjMgmt - 1 Excellence in Software Engineering Repeatable Level Defined Level Manage. 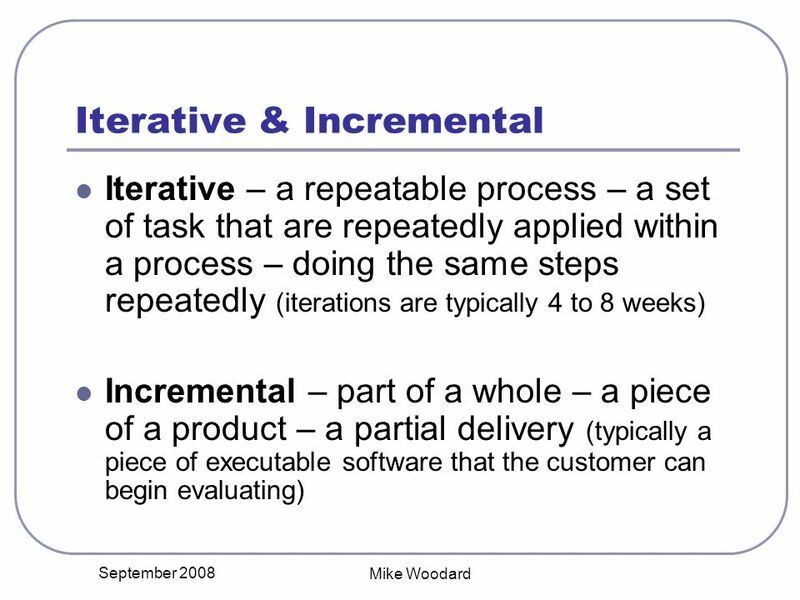 Objectives Explain the purpose and various phases of the traditional systems development life cycle (SDLC) Explain when to use an adaptive approach to. Unified Software Practices v 5.0-D Copyright  1998 Rational Software, all rights reserved 1 /26 RUP Architecture.